After a rocky few months—made only harder by the ongoing self-destruction of the director’s long-time collaborators at The Weinstein Co.—Quentin Tarantino’s latest feature finally has a starring cast, and a name. Variety reports that Brad Pitt and Leonardo DiCaprio have both signed on to star in the director’s new movie, Once Upon A Time In Hollywood. Although they’ve never appeared in a film together (outside The Audition, a Martin Scorsese short from 2015 that’s never had a commercial release), both men have worked with Tarantino before; Pitt in Inglourious Basterds, and DiCaprio in Django Unchained. 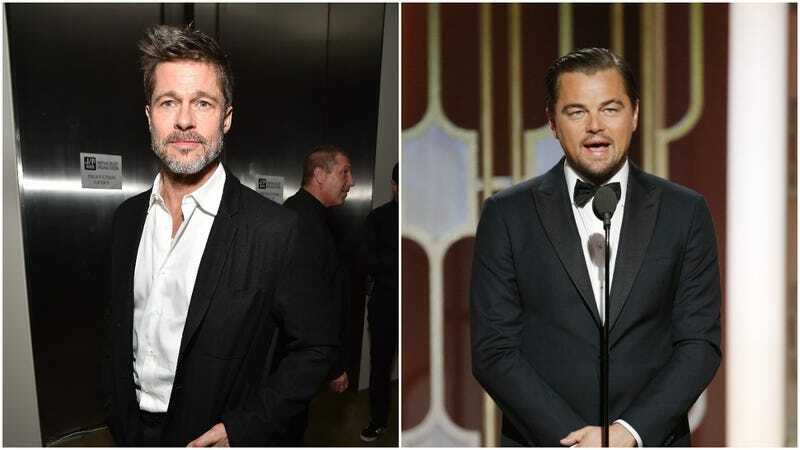 This time, the two will play old friends making their way through Hollywood in the late 1960s, DiCaprio as washed-up cowboy actor Rick Dalton, and Pitt as his long-time stunt double, Cliff Booth. (And, yes, those are the most Tarantino-y old actor names we could think of, too.) As previously reported, the film will take place in 1969, and will presumably center at least in part on Dalton’s next-door neighbor, famous murder victim Sharon Tate, and the Charles Manson-led cult members who ultimately took her life. Meanwhile, Once Upon A Time is Tarantino’s third consecutive film title (after Django and The Hateful Eight) to riff on the name of a famous Western; it’s presumably intended as an homage to Sergio Leone and his Once Upon A Time In The West and Once Upon A Time In America. The film is currently scheduled for an August 9, 2019 release.